At the age of seventeen, Pavol Lisy (5d) has won his third straight Slovak Championship. The games were played May 4-8 in seven rounds in Stakcin, a village both large (in area) and small (in population) near the eastern tip of Slovakia, noted for its natural scenery. As in 2010, Pavol emerged undefeated, beating all dan-ranked opponents in the 32-man field, including former Slovak champions Xaver Gubas (3d, 2nd) and Miroslav Poliak (1d, 10th). Maros Kral (3d) finished third. 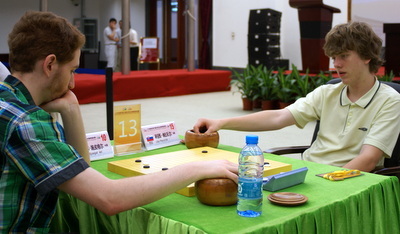 Pavol was also undefeated in the five-round 9×9 event, Xaver again being runner-up while Peter Karailiev (1d) finished third. Results of both events are available here. Go players who would like to see some of Slovakia’s scenery for themselves and play go in a more relaxed atmosphere might want to check out the Slovak Go Festival scheduled for June 15-17 in Plavecky Stvrtok, near Bratislava. An English-language registration form and schedule are available here.